Bamboo is the ultimate solution for cutting toolpath generation with different technologies. Given a project, either 2D or 3D, Bamboo can compute all the strategies needed for a safe, quick and efficient cutting toolpath. Fully integrated into Rhinoceros, Bamboo can generate the requested toolpath starting from your CAD projects, with no need of any kind of conversion or alteration. Bamboo is designed to interact with Mosaix nesting software, allowing the user to optimize the layout of pieces, optimize surfaces and start the cutting procedure, all from the same window. Bamboo generates cutting tool path for different technologies: WireEDM, Laser, Waterjet, Oxygen-flame cutting, Plasma cut, Cutting Plotter. Bamboo is continuously updated to grant the compatibility with different cutting technologies. The machining tree allows with extreme simplicity the insertion, modification and rescheduling of the machinings. In this way, it is operational after a few hours and without the need for in-depth training. 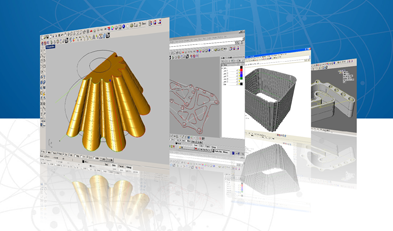 Among the different commands, the dynamic wireframe or solid simulation allows instant verification of calculated cuts, so as to complete the process of creating programs with maximum security and optimization. The processes can be reprocessed at any time for any CNC. Bamboo includes a feature that defines the draft angle for the 4 axis toolpath, starting from a bidimensional profile. Thanks to this feature, available for every single element of the profile, it is possible to define, in presence of radius, the development of the draft (constant or variable in relation to the angle itself). Two axes cutting provided by Bamboo allows the generation of toolpaths with automatic strategies that manage multiple transitions, up to seven times, with relative technologies for roughing, semi finishing, finishing, marking. Bamboo manages: double swarf , edges management, draft angle, gaps/bridge, the cutting direction and relative optimizations. Cuts can be stopped or interrupted at the given swarf distance, while the direction of the toolpath can be set clockwise or counter clockwise and, in case of multiple transitions, unidirectional or bidirectional. Bamboo can fit every situation or habit by managing multiple engage/detach techniques, to allow all the manufacturing that need to keep pieces in contact with the surface, or if there’s the need to remove manually the result of the process. Profiles can be cutted partially to allow further works. All this huge array of functions can be managed simply and intuitively by the user. Four axes cutting can be generated from two synchronized profiles, from a 3D model or from a 2D profile where the draft has been applied. Also in this case it is possible to apply the automatic strategies included in the 2 axes issue; swarf, angle for each side, constant or variable radius and the height of the piece can be easily managed. In case of small profiles, Bamboo provides the “Pocketing” function to destroy the material the swarf is made of, in order to prevent breakage issues. Bamboo provides also a function to generate a toolpath for the semifinishing of slots. Bamboo provides customizable technological table for every machine to reach the best effort in toolpath generation on any technologies. Those boards allow the management of all the typical parameters of toolpath generation, for example: corrector, value corrector, GAP, offset, speed, engage/detach speed, feed-rate and distances for roughing function, recover tail. Bamboo also provides eight special boards for the most particular toolpath; in fact, user will just have to program the 2 or 4 axes toolpath as usual, then he will choose the material to cut, the CNC type and the related technological Table; this way the generated program will contain all the information needed about the cutting parameters. Bamboo provides a realistic simulation of the whole toolpath, showing the motion of all machining process. Even the work piece is shown in detail. Every stage of the toolpath can be simulated to determine the optimum part-setup and to avoid unnecessary try-outs on the real machine. Reliable Post Processors for most of the cutting machines are available. Additional post processors are always under development due to new customer requirements. In all these, identical profiles should be processed using the subroutine technique; the toolpath generated this way, will be shorter and better manageable by old machines.The radius inside the profiles or inside the model to cut will be managed as circular interpolations or divided in segments.